Royal Lepage says there is no condo bubble in Toronto - I say there is. In fact I believe there is a nation wide bubble in this country! 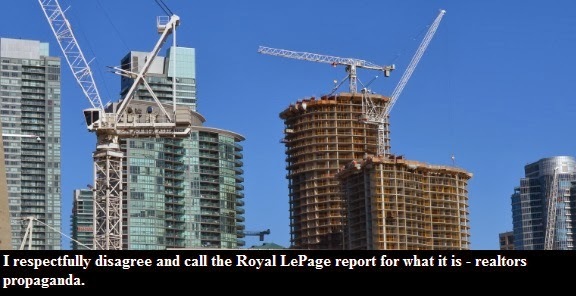 Royal LePage hired Will Dunning Inc. to produce the report called Sustainable Growth in Condominium Sector Supported by Market Trends and Demographics. In my view the report is a joke. Not only does it look like a sales pamphlet but it's also full of misinformation! Will Dunning says that "an essential element of a housing bubble is that demand becomes divorced from economic fundamentals and that has not occurred in the markets for condominiums". Arguably, the most important factor underlying real estate evaluations is income. If both home prices and incomes went up fifty percent in a decade - there is no issue. I would say that kind of growth is supported by fundamentals. Heck - even if incomes grew 20% and condo prices grew by 50%, with low interest rates, this would still be justified in my view. For instance, in Toronto condos rose in price by 55% between 2001 and 2011 (median condo price) when adjusted for inflation. During the same time span incomes had declined by 3%. Mysteriously, the report - sponsored by a real estate firm - had no mention of this. In fact, Will Dunning Inc. did not even analyze the relationship between condo prices and incomes. Instead the report focused on vacancy rates, demographics and price-to-rent ratio. 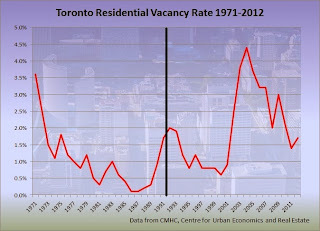 The report says that vacancy rate in Toronto was relatively low, 1.7%, compared to a 20 year average of 2.0%. Will Dunning made it sound like there is a housing shortage and as if vacancy rates matters. You see, you can support any point that you want depending on the time frame that you select. In this case Will Dunning decided to focus on a period of the past 20 years (right of the black line) while the data goes all the way back to 1971. If you average the vacancy rate over the past 41 years you will get 1.5%. 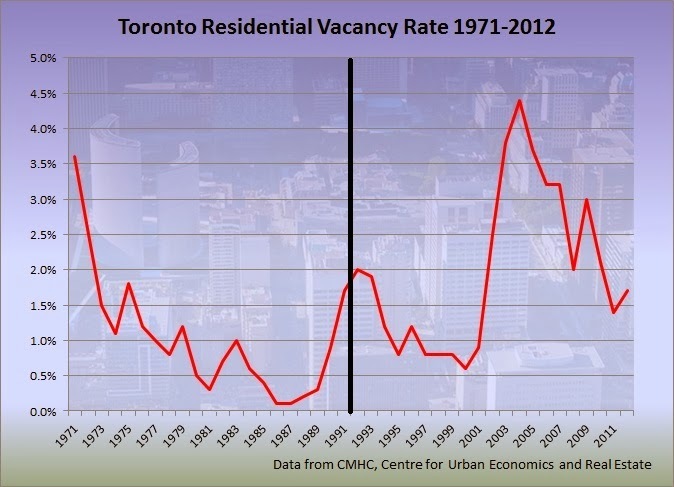 Suddenly the most recent vacancy rate for Toronto does not seem that low. If the above report was truly objective, it would have mentioned the Toronto housing bubble in the late '80s. And it would have provided an example of what low vacancy rates really are. Also, the report would have mentioned that low vacancy rates change nothing, as low rates during late '80 did not prevent the bubble from bursting. With regards to demographics Will Dunning says that baby boomers will account for the largest amount of the demand. Additionally there will be strong demand from the echo boomers (25-34 years). Alright, baby boomers would be downsizing and echo boomers would be buying condos because they can't afford anything else. But if both groups will be moving to condos than who is going to be buying the traditional housing units? The report briefly mentioned job creation as a critical factor influencing condominium development in Toronto. Yet again, Will Dunning chose a time frame which would suit his needs (1996-2012). 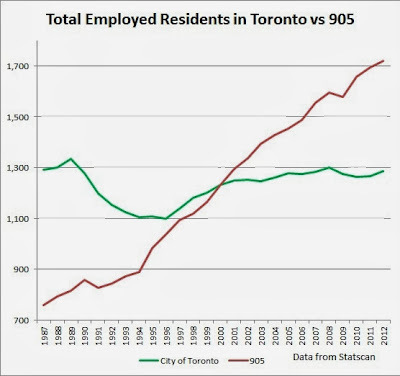 Since most of the condos are built within city limits, let's take a look at the employment picture in the City of Toronto. As you can see job creation in the city was stagnating for the past decade. 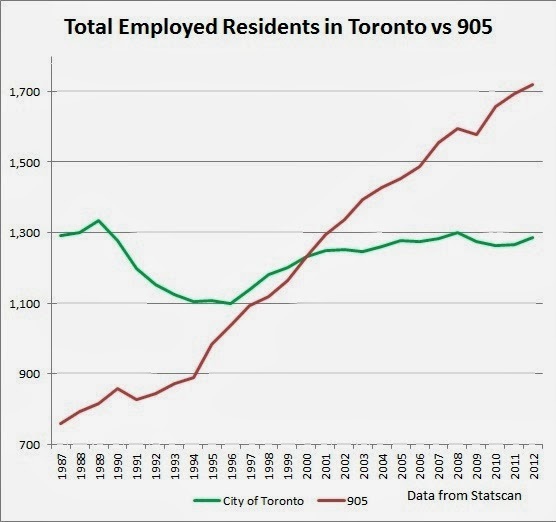 Moreover, there were less employed residents in Toronto than in the 1989 - the peak of the first housing bubble. Pretty much only 905 residents benefited from job creation and not the city residents. Finally, the report looked at price to rent ratios. But wait - it's not an actual price to rent ratio. As Garth Turner would say, it is a frankennumber. You see Will Dunning constructed condo net-rent-to-price ratio for the Toronto area. Apparently it shows the net rent to values ratio as compared to bond yields. Anyhow, given all the data manipulation in this report so far I am sure this net-rent-to-price ratio was presented in order to make it look better than it really is. Not to mention it was based on rough estimates. Take a look yourself on page 21. The picture below shows the old school price-to-rent ratio. As you can see the index is currently way above the peak of 1989. Keep in mind that current incomes in Toronto are at 1987, though interest rates are presently lower. P.P.S Median condo prices rose by 6.19% since 1996 on average and detached home prices rose by 6.18% in the GTA. According to the Royal LePage report, SFD prices rose at a rate of 5.7% over the past 20 years while condos rose at rate of 4.5%. First of all, Will Dunning's report bases its estimate on a Royal Le-Page survey which has built in margin of error. Secondly, 20 years ago condos were falling in price faster than the detached homes due to the burst of a housing bubble in the late '80s. Thus, analyzing price trend from the bottom (1996) is more valid. In sum, the above report suggest that there is a supply constraint which results in SFD homes appreciating at a faster rate but according to crea data there is no such relationship. If Toronto was really running out of land, one would expect detached homes to appreciate at a much faster rate than the condos. There is still a HUGE amount of land in the city available for the condo developments. At the end the report, the role of low interest and the possibility of the condo market experiencing some instability in the next two years is mentioned. Yet, Will Dunning says that it can reasonably be expected that over the long-term, condos will experience price growth similar to the traditional housing forms. In sum, the report is trying to paint a better picture than it really is.